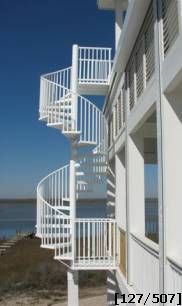 Stairways, Inc.'s welded aluminum spiral stairs in coastal environments perform well. This application from a lower deck face to an upper deck face is not as common as spiral stairs with a landing top only. The height accommodated a turn and a half, meeting code. When two landings connect to deck faces make sure to check for deck alignment. The offset from upper to lower, required landings of different lengths to maintain proper center column alignment. Spiral stair center columns, in elevated lower level conditions, can continue to the ground in order to mount. This spiral stair made use of a wood column matching all of the columns supporting this beach home. Stairways, Inc. designed an aluminum receiver to mate with the wood column. Bring your spiral stair design issues to Stairways, Inc., we have the experience and problem solving capabilities to help you with your next project.